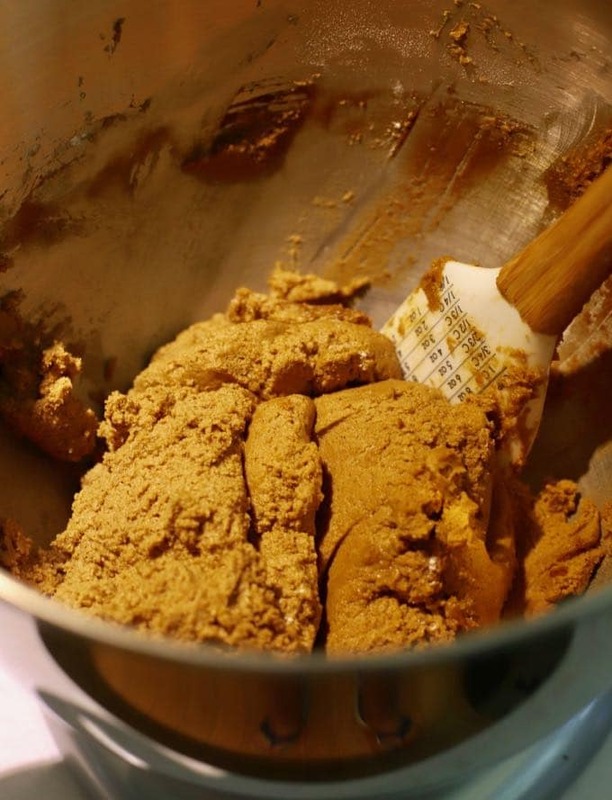 This recipe for Old-Fashioned Crunchy Gingersnap Cookies is simple and easy to make. The cookies have a strong ginger flavor and are full of dark, sweet, pungent molasses, and warm aromatic spices including cloves and cinnamon. The calendar says it’s Fall, but with 90-degree temperatures in North Florida every day, it’s hard to believe! However, just dreaming about a real Fall, with crisp cool air and the upcoming holidays, makes me think of all things warm and cozy. 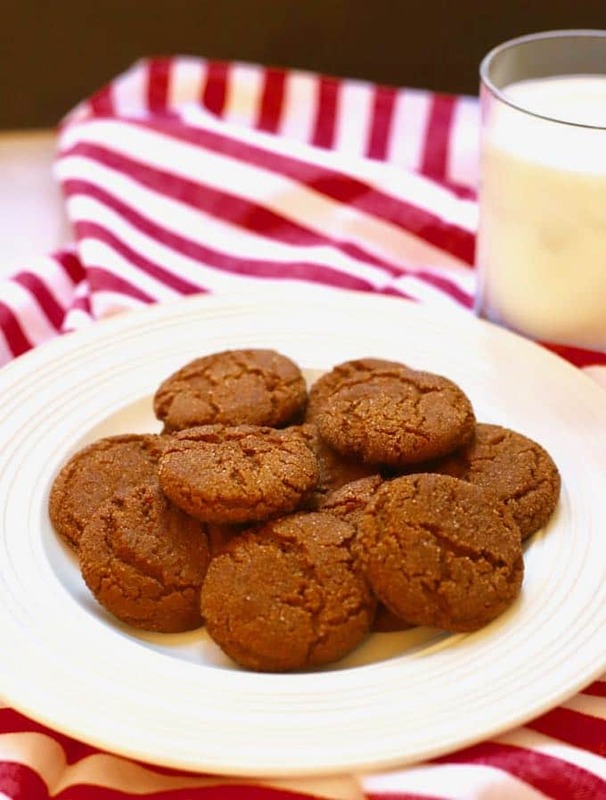 And what could be cozier than Old-Fashioned Crunchy Gingersnap Cookies and a glass of milk? Gingersnap Cookies are a favorite in our house, and I hope you like them as much as we do. If you prefer a little softer cookie, simply reduce the amount of cooking time and you will have a cookie that is crispy on the outside and softer on the inside. Gingersnap cookies store well in an airtight container, and they keep their telltale “snap” for well over a week. They are also a sturdy cookie and would be a great choice to pack up and mail to loved ones. In the unlikely event, you have leftover gingersnap cookies, they make a great substitute for graham crackers in a graham cracker pie crust. Check out my recipe for Meyer Lemon Tart with Gingersnap Crust. If you like Fall recipes, you might also like these popular recipes on my blog: Apple Dapple Cake with Caramel Glaze, Fall Feast Roasted Pumpkin Soup, and Butter Pecan Cookies. What’s the difference in gingersnap and gingerbread cookies? 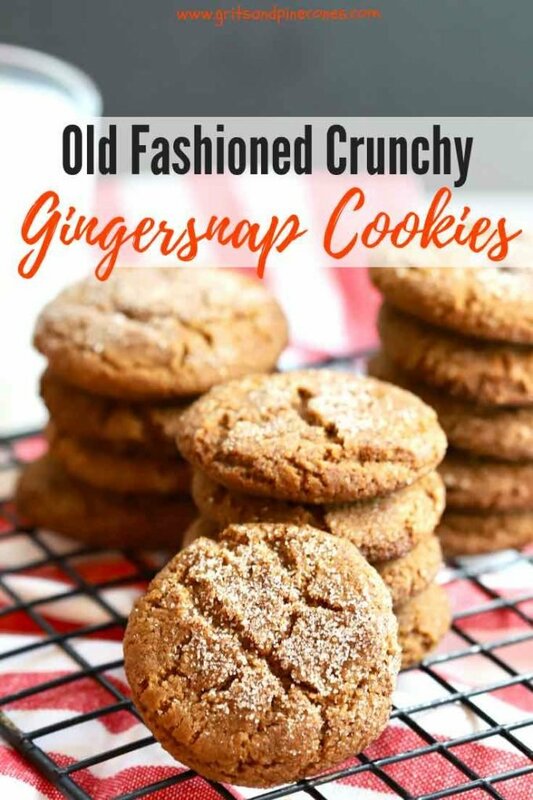 These deliciously crunchy gingersnaps are a classic holiday cookie and have a lot in common with their cousin, gingerbread cookies. The ingredients are basically the same, but gingerbread cookies are softer and traditionally rolled out and cut into holiday shapes, most notably, adorable gingerbread men. 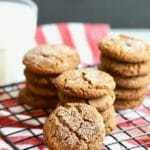 What’s the difference in gingersnap and ginger or molasses cookies? Gingersnap cookies are also similar to ginger cookies, also called molasses cookies. Again, the ingredients are basically the same, but ginger cookies or molasses cookies are much softer and chewy. Can you freeze gingersnap cookies? Yes, both Old-Fashioned Crunchy Gingersnap cookies and the dough freeze beautifully. 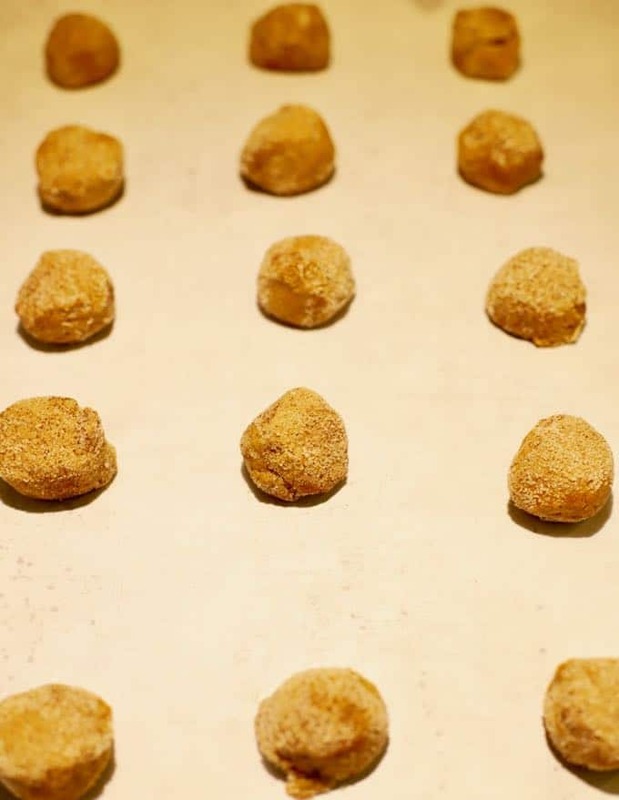 To freeze the dough, follow the directions, roll into balls and roll in the cinnamon sugar. Place the balls on a baking sheet and freeze for an hour or so. Remove from the freezer and place the dough balls in an airtight plastic freezer bag. To bake, remove the desired quantity of frozen dough balls, place on a parchment paper lined cookie sheet and bake as directed. To freeze the cookies, place the cookies in an airtight plastic freezer container and freeze for up to three months. To serve, remove from the freezer and allow to thaw. 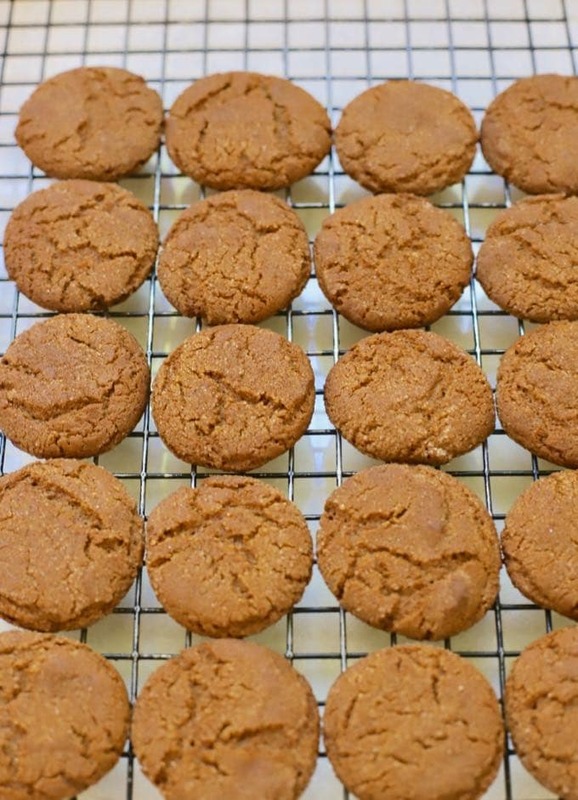 How to make Old-Fashioned Crunchy Gingersnap Cookies. 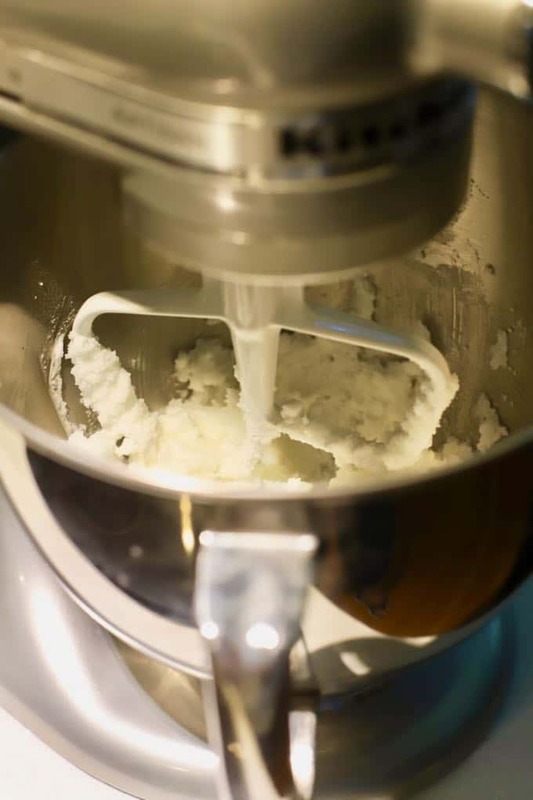 Add the shortening, one-cup sugar, salt, and baking soda to the bowl of an electric mixer and mix until smooth and creamy. Add the egg, mix until well incorporated. Add the molasses, and again mix until well incorporated. Add the flour, one teaspoon cinnamon and the rest of the spices to the dough and mix until well incorporated. Set aside. Add one teaspoon cinnamon and 1/4 cup of sugar to a shallow bowl or pie plate and mix well. Use a 1-inch ice-cream scoop or a spoon to make 1-inch dough balls. Drop the dough balls into the sugar-cinnamon mixture and roll around until the balls are coated. Transfer the balls to a baking sheet which has been sprayed with non-stick cooking spray, lined with parchment paper, or a silicone baking mat. Be sure to leave approximately 1-1/2 inches between the dough balls because they will spread. Bake the cookies for 10-11 minutes. Remove the cookies from the oven, use a spatula and place the cookies on a wire rack to cool. Allow the cookies to cool completely before storing in an airtight container. To accurately measure the flour, use a large spoon to first fluff up the flour in the container. Then use the spoon to lightly scoop the flour into the measuring cup. Finally, use a knife or other straight-edge utensil to level the flour across the measuring cup. 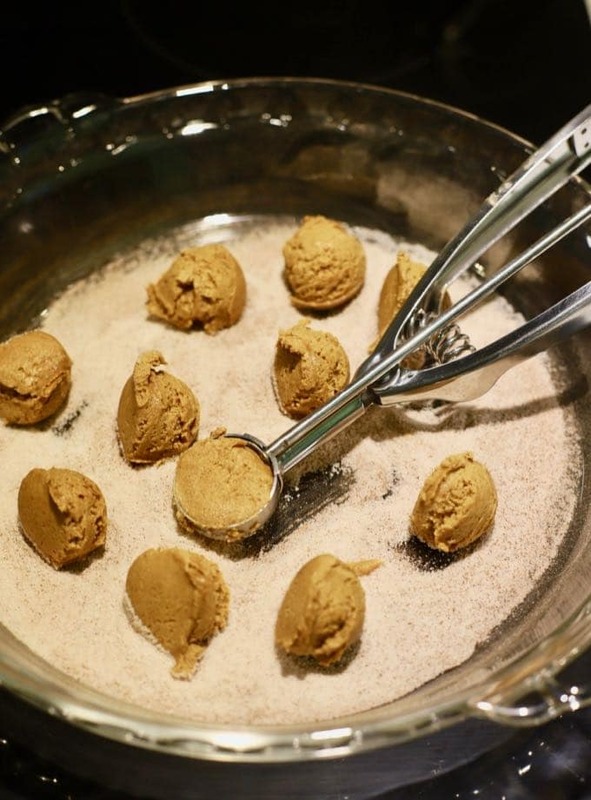 To freeze gingersnap cookie dough, follow the directions, roll the dough into balls and roll in the cinnamon sugar. Place the balls on a baking sheet and freeze for an hour or so. Remove from the freezer and place the dough balls in an airtight plastic freezer bag. To bake, remove the desired quantity of frozen dough balls, place on a parchment paper lined cookie sheet and bake as directed. 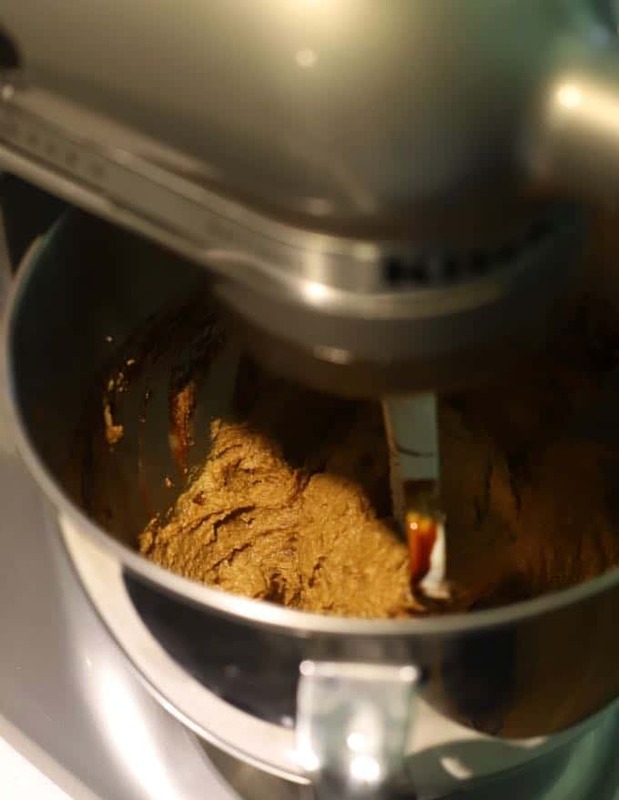 To freeze gingersnap cookies, place the cookies in an airtight plastic freezer container and freeze for up to three months. To serve, remove from the freezer and allow to thaw. 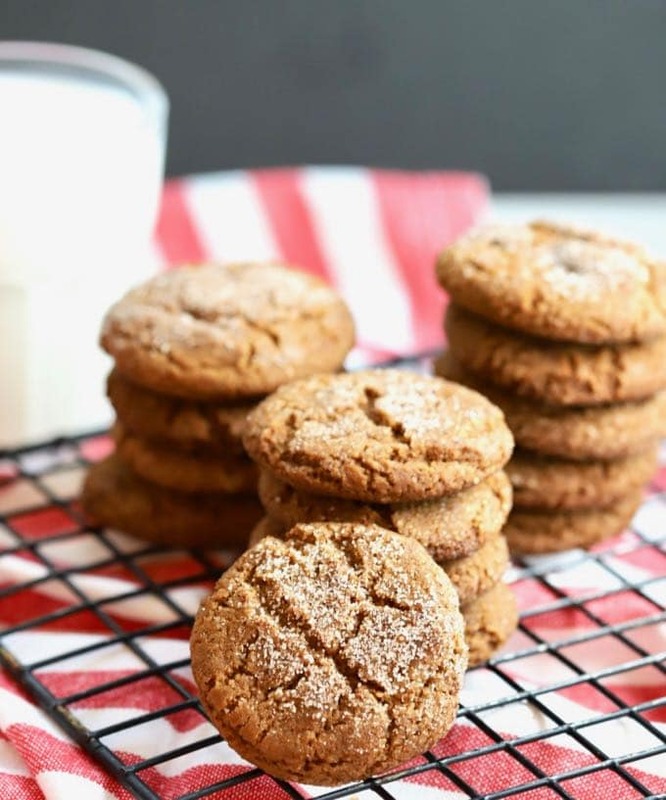 This recipe for Old-Fashioned Crunchy Gingersnap Cookies is simple and easy to make. The cookies have a strong ginger flavor and are full of dark, sweet, molasses, and warm spices including cloves and cinnamon. Transfer the balls to a baking sheet which has been sprayed with non-stick cooking spray, lined with parchment paper, or a silicone baking mat. Be sure to leave 1-1/2 inches between the dough balls because they will spread. Gingersnap cookies store well in an airtight container, and they keep their telltale "snap" for well over a week. They are also a sturdy cookie and would be a great choice to pack up and mail to loved ones. If you have leftover gingersnap cookies, they make a great substitute for graham crackers in a graham cracker pie crust. Check out my recipe for Meyer Lemon Tart with Gingersnap Crust.